Francois Hollande's promises have become a reality of more of the same, with poll ratings sliding and division within the French Socialist party. 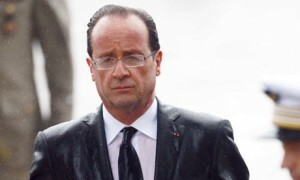 Francois Hollande is already deep into choppy waters just four months after being sworn in as France’s new President. A European storm is looming large with some MPs from his own Socialist party and key Green allies threatening to rebel against a new EU treaty that will impose on France yet more of the self-defeating austerity medicine that has destroyed growth in the country and the rest of the eurozone. On the campaign trail Hollande promised to renegotiate the Fiscal Compact, dreamed up by Germany’s Angela Merkel and backed by former French President Nicolas Sarkozy. But once in the Elysee Palace he failed, like his predecessor, to extract any concessions from the iron Chancellor. The treaty remained unchanged – except for a vague “growth pact” appendix that was widely seen as a token sweetener for the new EU rules that would force lawmakers to maintain a balanced budget, curtailing the parliament’s sovereignty and damaging the already fragile economy, welfare system and public services in the process. A recent poll found 66% of Socialist party supporters want a referendum on the matter, which is a disturbing possibility for Holllande. The last time there was a referendum campaign over Europe, in 2005 on the ill-fated European constitution, it badly split the Socialist party. And it would come at a time when senior party figures are already disgruntled over his handling of the economy, with unemployment at a 13-year high and a series of high profile factory closures threatened, like Peugeot Citroen’s plant in the depressed Paris suburb of Seine-Saint-Denis. In addition to dissent in his own camp, Hollande has to contend with radical left leader Jean-Luc Melenchon, who has entered the battle over the Fiscal Compact, otherwise known by critics as the Permanent Austerity Treaty. Back in the media spotlight after his failed, albeit impressive, bid for France’s top political job and the defeat in the subsequent battle for a parliamentary seat at the hands of far right leader Marine Le Pen, the ex-Socialist minister is now agitating for ‘rebellion’ by his former party colleagues. Melenchon has also been rallying his troops in the communist-led Left Front alliance around a campaign for a referendum, with a national demonstration called for September 30th. A number of NGOs, and the CGT – France’s largest trade union confederation – have also come out strongly against the Fiscal Pact. By railing against what remains essentially the same old ‘Merkozy’ treaty, Melenchon is on fertile ground: former president Sarkozy was ejected from the Elysee Palace a very unpopular man, and the idea of Germany dictating things is always guaranteed to stir up Gallic pride. Hollande is trying to avoid putting the matter to the people, and plans instead a parliamentary vote on it, with legislation to be tabled before MPs next month. But according to one opponent in Hollande’s party, as many as 22 Socialist MPs may say ‘Non’ to the strict budgetary pact. As for the Greens, their leader Eva Joly is refusing to be drawn on whether they will “flex their muscles”, but the party is formally opposed to the pact and already Jean-Vincent Place, their parliamentary chief, has indicated he’ll be voting ‘Non’. Commentators believe the President will get his way in the vote in the National Assembly, but might face the embarrassment of having to rely on the right-wing main opposition UMP, Sarkozy’s party. That could further dent Hollande’s popularity, which is already badly sliding, as polls show. Having staked much on delivering a new growth-oriented direction for Europe, the President may have expected to get some credit for last week’s shift in the European Central Bank’s stance towards a more interventionist policy – that is, the commitment to buy southern eurozone government bonds to lower sky-high interest rates. Some argue it is indeed a victory for Paris, over the Bundesbank’s austerity hawks – but there are some dangerous strings attached. In any case, Hollande’s TV announcement on Sunday night of a fresh round of spending cuts and taxes to meet deficit targets do not fit a vision of Europe on the path to growth. Nor will they make him any more popular. There was, however, one bit of good news for French people hoping for a clear break from Sarko’s rule: Hollande has confirmed that contrary to press reports in recent days – and amid news Bernard Arnault, France’s richest man and chief executive of Moët Hennessy Louis Vuitton was lobbying the government over the wealth tax while planning an application for Belgian citizenship – he is not retreating from a 75% tax on incomes over €1 million. Promises to soak the rich, and make large companies pay a fairer share in tax too, will be honoured. Equally, the Dutch just returned a government which is not only pro-Europe but one which will tend to support Hollande’s position, and the key bailout funds have been ruled constitutional by the German courts. Merkel, meanwhile, is facing an election in a year….where her right-wing coalition is…very very unlikely to survive. There may be a left-right coalition, but she WILL have to give up much of her cherished hardline views if she is to retain the premiership.